My father, Fred, was a foreman automobile electrician in a garage in West Wickham, Kent and had been a motor mechanic in the RAF during the war. We lived in Addington, Surrey and possessed 20 year old cars at a time when only the well-off could afford a new one and there were very few cars on the roads. This 1931 Triumph Super Seven (which we always called a Triumph 8) was owned by my father for a short while in about 1951. There was a bench seat in the front for my parents and a dickey seat where I and my sister rode - I was 10 years old and my sister 3, no seatbelts in those days and we were completely out in the open with just a rug over us, watching the road through the celluloid rear screen. These Triumphs were well built strong cars, this was proved when my father, driving alone to work in winter down a long open main road hill, lost control on black ice and spun round several times eventually crashing backwards into a large cast iron lamp post on the other side of the road then bouncing off and landing about 10 yards away. The lamp post was demolished but the Triumph only suffered a dent in its spare wheel! Although the engine was designed by H.R.Ricardo it did not have a good reputation and would run big-end bearings. On one occasion my father was returning at night from a long trip when a big-end failed. He stopped at a wayside garage and using their hoist he removed the sump and pulled out the offending con-rod and piston, taped up the oil hole in the crank pin, replaced the sump, filled up with oil and drove home! It ran a bit rough and he drove slowly, waving other cars past with the con-rod and piston, but it got him home. The journeys in the Triumph that I can remember were in the dickey and around London at night in the winter, huddled up against the rear screen to keep the rain off. Eventually our tourer was replaced by a more practical saloon version about which I can remember very little. The picture was taken at Limpsfield Chart near Westerham, Kent. 4 cyl. 800cc. Ricardo design. Bore and Stroke - 56.5mm x 83mm. 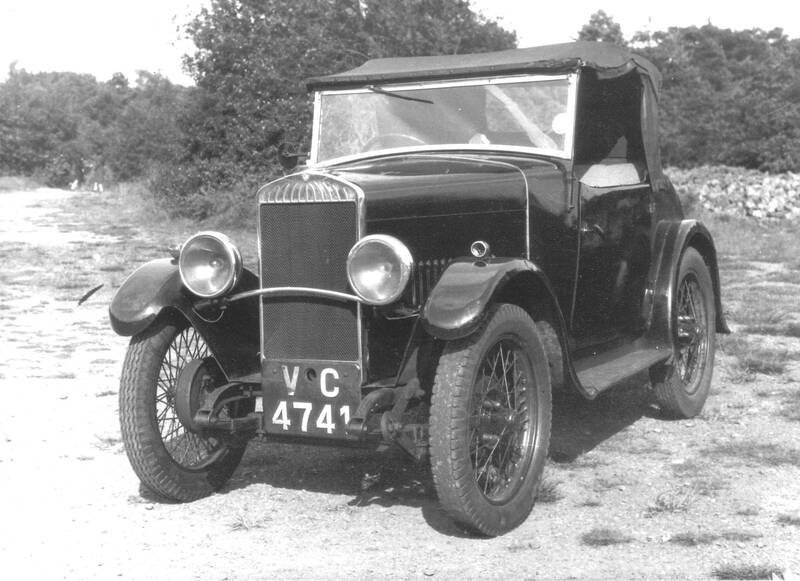 One of the first cars to have hydraulic brakes.